Opening on April 4th, 2012 at the Andrew Freedman Home in the Bronx, New York is This Side of Paradise , presented by No Longer Empty. The exhibition features a roster of 26 artists based in New York and abroad and is curated by Manon Slome who is also the director of No Longer Empty. The mission of this nomadic group is to bring art and community together in spaces that were once utilized and now, for the most part, remain empty or abandoned. Such is the case with the Andrew Freedman Home which was built to house retired senior citizens in 1924 and has been owned and operated by Mid-Bronx Senior Citizens Council since 1984. The non-profit organization occupies the ground floor and is completely community oriented offering services such as after school programs, WIC , job training, GED opportunity, ESL, Pre-Kindergarten classes amongst others. I recently spoke with Jeanette Puryear, Executive Director of MBSCC, at the Andrew Freedman Home about their involvement in community based projects, working with No Longer Empty, and the importance of community based art exhibitions. Mrs. Puryear informed me that they are excited to be collaborating with No Longer Empty as they share a mutual interest of linking community through art. MBSCC already has a working relationship with the nearby Bronx Museum and relish in bringing artists from the community and beyond into the Bronx. Cut to Manon Slome, the high energy head curator of No Longer Empty, who also offered me a private tour of the Andrew Freedman Home and a preview of the upcoming exhibition, This Side of Paradise. 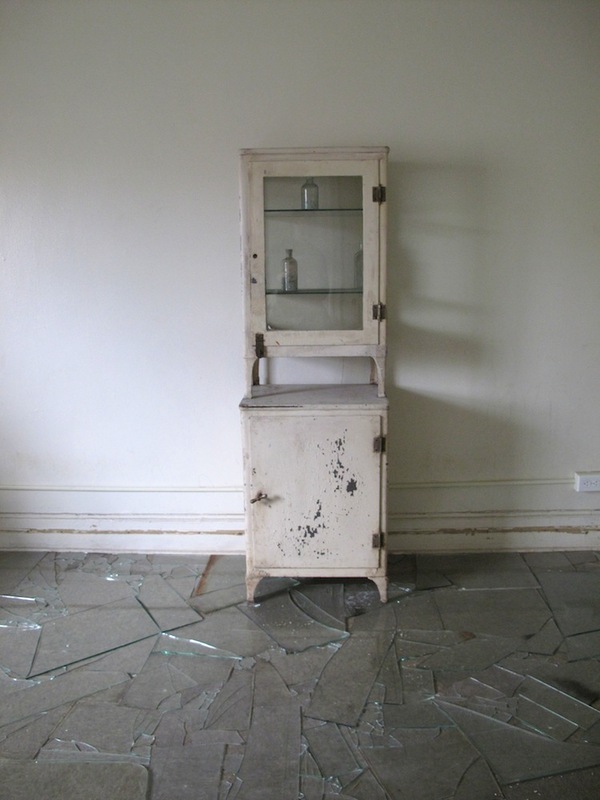 Artists were invited to make in-situ installations on the 2nd floor of the home, choosing to interact with, or not, the remnants of previous tenants. Doing a quick walk-through of the main floor, the work of Nicky Enright caught my eye. The artist born in Ecuador and lives and works in New York. 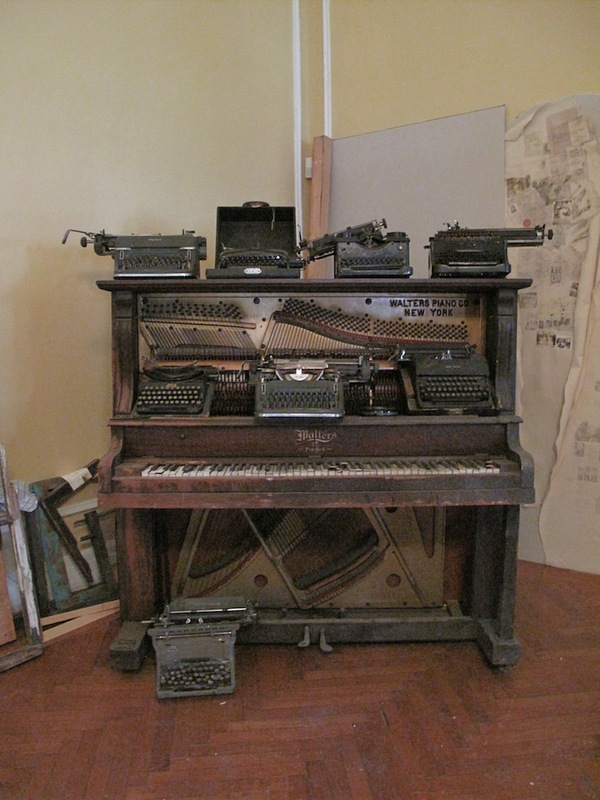 He utilized an original piano that had been discarded by previous residents. The installation, combined with typewriters is simple and eerie. Located in a large ballroom with warm butter colored walls, the piece is both inside and out of its element. When speaking earlier with Mrs. Puryear of Mid-Bronx, she informed me that after the building failed at surviving as a retirement home and was abandoned, the former Mayor Koch commissioned a series of landscape paintings on cardboard which were fitted into the otherwise vacant windows. The purpose of the cardboard was to create an illusion, giving passersby an artificial yet interesting visage in comparison with dusty, barren rooms. No Longer Empty is changing that, once again offering art, this time at a much higher level. The second floor is where most of the artists have made site specific installations. 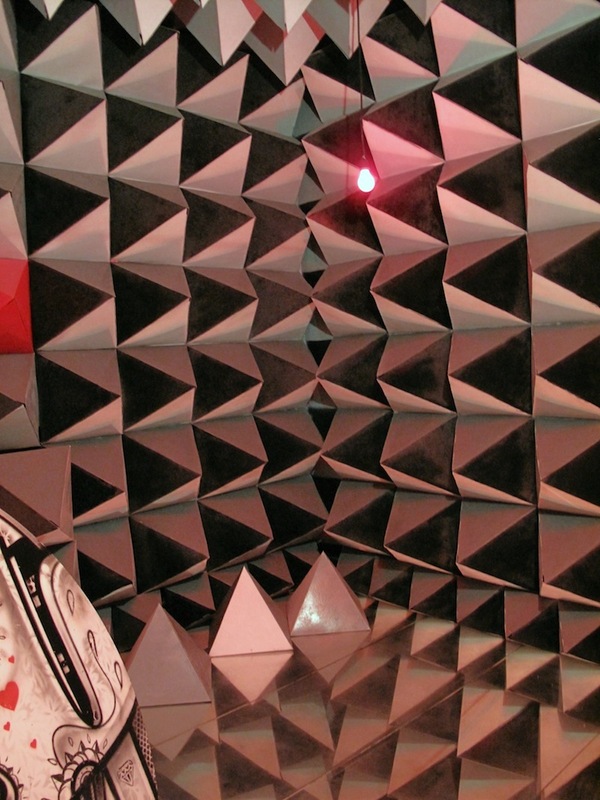 Each individual or artist group involved was assigned a room to make work. The rooms are similar in format and some are adjoined by adjacent bathroom facilities. That said, even if the deserted bedrooms were once originally similar they now each have a specific flavor and aesthetic that varies from artist to artist. Another favorite of mine is by Scherezade Garcia in collaboration with the Lehman College Art Gallery. The room has literally been turned upside down. 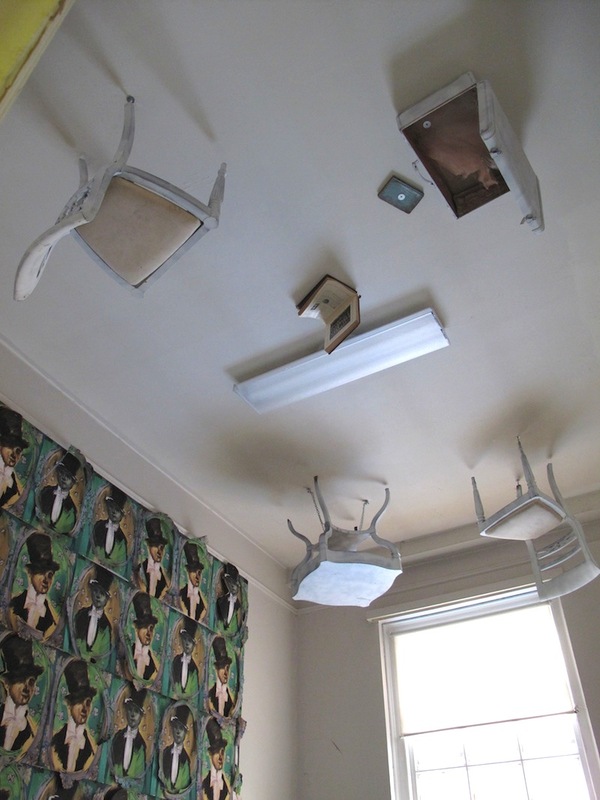 Furniture has been attached to the ceiling and the opposite wall contains a wallpaper installation of portraits of the late Andrew Freedman himself. It’s as if the artist conducted a seance in order to conjure the ghost of the original owner and in doing so, flipped the contents of the room. When recently in attendance at the home, light streamed through every window. But evidence exists around almost every corner juxtaposing life and death, abandonment and rebirth. It isn’t common for property to exist in New York City at this magnitude, nonetheless a majority of it to have been vacated for so long. Dust resides in the dated carpet and on almost every unused surface. Tapping into the subtle resonance of sickness and geriatric lifestyle is artist Gian Maria Tosatti . After having recently completed a residency and intense, site specific installation through LMCC on Governors Island, Tosatti delighted in the opportunity to install another site-specific project, this time at the Andrew Freedman Home. Utilizing glass found in various rooms, the artist delicately and precisely fit the glass, as pieces of a puzzle into the floor of one of the rooms. Also installed is an old file cabinet containing medical records of some of the previous inhabitants. As the viewer is invited to enter the room and proceed with caution, I found that I was caught off guard as glass cracked and shattered under the weight of my body. The varied audio which arises due to public participation is unexpected, however pleasant surprise adding to the awkwardness of the already surreal experience. Sitting down with Manon Slome in one of the newly converted rooms on the first floor in what will be a bed and breakfast, I asked her about her involvement with the only No Longer Empty, which has been around for only three short years and This Side of Paradise which is their 13th exhibition to date. No Longer Empty, originally had exhibitions in storefronts, opening the door to people who could now find art where they least expected it, attracting those who would and would not normally seek out contemporary art. The organization has evolved as has the programming which now includes panel discussions and events open to the public, dictated by each specific location. As the nature of museum changes, No Longer Empty strives to reach out to new audiences and offer artists the opportunity to step outside of his/her respective studio. This Side of Paradise will be on view at the Andrew Freedman Home until June 4th giving the public the opportunity to experience work in a somewhat remote and exciting location. Opening night will feature performances and events are scheduled to occur throughout the duration of the exhibition. Opening Reception will be Wednesday, April 4 from 6 to 8pm followed by the Speakeasy After Party Fundraiser sponsored by St. Germain starting at 8:30pm. Support NLE and future exhibitions by purchasing tickets here. Exhibition Hours: Thursday to Sunday, 1pm to 7pm (extended hours when events are hosted).